Where did Francis Drake grow up? Francis Drake was born sometime between 1540 and 1544 in Tavistock, England. His father was a minister for the navy and Francis grew up near the sea. He went to work for a sea captain at a young age and found his home living and working on a ship. Someday he would make his fortune and fame at sea. Drake's first expedition was with John Hawkins. He captained the ship Judith, one of six ships that made up the fleet. Hawkins first led the fleet to Africa where they captured people to sell into slavery. Then they sailed across the Atlantic to the New World. They sold the slaves at a Spanish port, but they were betrayed. Spanish warships attacked the fleet and destroyed many of the ships. Drake and the Judith were able to escape, but he never forgave the Spanish. After returning from the New World, Drake wanted revenge on the Spanish. He took up the life of a privateer. As a privateer he would attack the enemy ships of Britain, mostly the Spanish, and take their cargo. To the Spanish, he was considered a pirate. To the English, he was a hero. Over the next several years Drake attacked Spanish towns and ships taking much of their gold and silver. He became a rich man. Queen Elizabeth I noted his success and gave him a fleet of ships to take to South America and plunder the Spanish. Drake and his fleet of five ships left England on November 15, 1577. He captained the largest ship, the Pelican, which he would later rename the Golden Hind. They had many adventures along the way. Many of the sailors died from disease. Drake even had one man beheaded for leading a mutiny. The fleet traveled across the Atlantic and down the coast of South America. After passing through the Strait of Magellan, they entered the Pacific Ocean and went north along the coast of Peru, ransacking towns along the way. They also captured a Spanish ship named the Cacafuego. The ship was full of treasure. Drake would arrive home very rich! Eventually, Drake's fleet was down to a single ship, the Golden Hind. After three years of sailing, on September 26, 1580, the ship arrived back home in England. Drake's expedition was only the second in history to sail around the world. He also brought back lots of treasure for the queen. 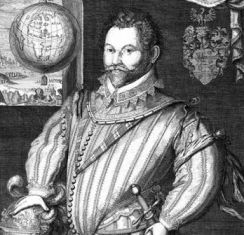 The queen was proud of Francis, she knighted him and he was now known as Sir Francis Drake. By 1588 King Philip II of Spain finally had enough of Queen Elizabeth I and her English privateers like Drake. 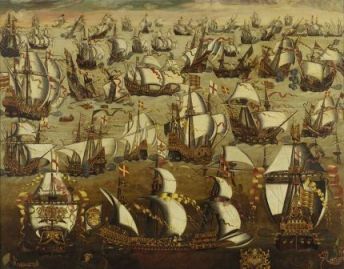 He assembled a huge fleet of Spanish warships called the Spanish Armada and sent them to crush the British and take over England. Queen Elizabeth had made Sir Francis Drake vice admiral of the English navy. They waited for the Spanish Armada to arrive. Many thought they had little chance. Drake had an idea, however. In the middle of the night they lit several empty English ships on fire. They sent them into the middle of the Spanish fleet. The captains of the fleet panicked and scattered. Then the English pounced. A little while later, a huge storm hit the fleet. Many of the Spanish ships were sunk or broke up on the rocks of England's shore. The English defeated the Spanish and now were the most powerful navy in the world. Drake continued to attack Spanish cities and treasure ships. He died of dysentery while on an expedition to the New World on January 27, 1596. He married twice. His first wife was Mary Newman who died 12 years after their marriage in 1569. His second wife was Elizabeth Sydenham. His wives rarely saw him as he spent much of his life at sea. He didn't have any children. The Spanish nicknamed Drake "El Draque", which means "The Dragon". The King of Spain put a bounty on Drake's head of 20,000 ducats. That's around $7 million in today's money! He was a member of the British Parliament for a time. He purchased a large mansion in Devon, England called Buckland Abby. Today it is open for tourists to visit. Take a ten question quiz about this page.